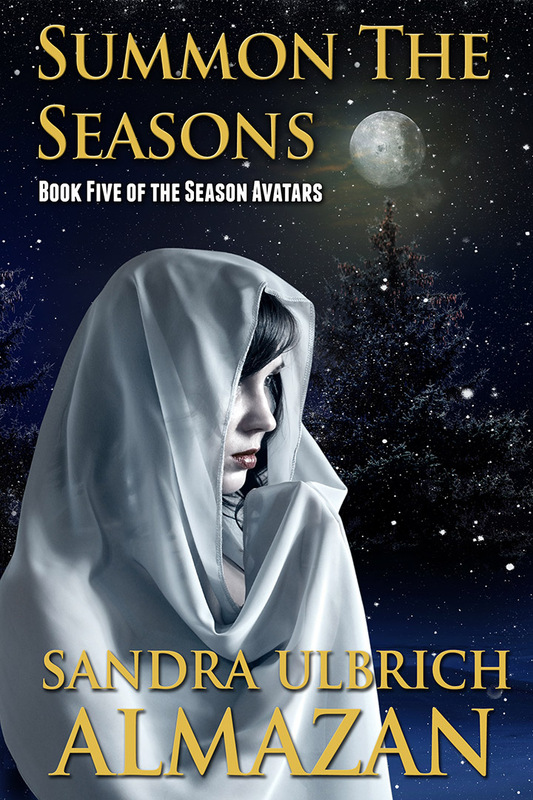 I'm welcoming Sandra Ulbrich Almazan to my blog today as a stop on her blog tour for her new book, Summon the Seasons, Book 5 of her series The Season Avatars.
" Feminism in a Victorian-Like Setting "
The nineteenth century may have seen the first women’s rights convention, but it was also when the cult of domesticity, which extolled women’s place in the home, flourished. Is it possible to have feminism in a Victorian-inspired setting? It helps if you’re creating the world yourself and can build feminism in the foundation, as I did in my fantasy Season Avatars series. The books are set in a country that’s mostly agricultural, but with textile and mining industries. They have steam-powered trains connecting cities and transporting food. The cities have daily newspapers, and the upper classes are starting to use electricity in limited areas. Although Challen is loosely based on Victorian England, I deliberately designed the culture to be more feminist. One of the most significant differences between Challen and Victorian England is that Challen has a polytheistic religion. There are two gods and two goddesses, each associated with a different season. Although the Goddess of Fall is linked to animals, She also protects the women of Challen. Women can ask Fall for help if they are assaulted by men, and She’ll send animals to protect the woman, attacking the man if necessary. Each deity has three Avatars (though only one is active at a given time) to do His or Her work. Fall’s Avatars are always female, which means there will always be at least one female spiritual leader in Challen. Finally, women who don’t want to marry can pledge themselves as Fallswomen. Men in turn can pledge themselves to the God of Summer and become Summersmen. Sometimes the Fallswomen and Summersmen serve at the Four Gods and Goddesses’ Temple or work for the Avatars, but they are free to pursue other work if they wish. Other factors in this culture give women more choices than they had in Victorian England. The Four choose Avatars from all classes, so universal basic education is necessary to make sure the Avatars are literate. A University is available for those who wish to pursue higher education. Knowledge about traditional herbs used to prevent or terminate pregnancy is widespread enough to give women some ability to plan their pregnancies. Even in Challen, it is difficult to remove all traces of female oppression. Upper-class and noblewomen are pressured to marry for money or to further family interests, and contact between unmarried people of different sexes may still be chaperoned. However, a determined woman can work around those obstacles, whether or not she has magic. Four female Avatars working together present a formidable force that few can resist. To obtain them, Kay’s quartet must travel across Challen, evading the King’s Watch and Selathens who want to protect their demigoddess, Salth, creator of Chaos Season. Kay’s deepest beliefs about her God and her longtime rival, Dorian, will be challenged during the trip. If she loses her faith and newfound courage, she will fail, and the rest of the Season Avatars with her. Sandra Ulbrich Almazan is the author of the SF Catalyst Chronicles series and the fantasy Season Avatars series. She’s also a QA Representative, a wife, a mother, a Beatles fan, and a member of the 501st Legion, but mostly she’s very tired. Guest Blog post: Author Janine A. Southard on "Hive and Heist"
Which is how I ended up with a multiple-POV young adult science fiction series about Druids on spaceships with no romance subplots. At first I was supremely unsure about this. I mean, the market is really not looking for it. · Young adult is popular, yes, but without a romance plot? Never. · Spaceships are good, yes, but without a military angle? No one buys that. · Druids are lovely, yes, but only in medieval settings or paranormal contemporary. On a spaceship? Nope. Too much cognitive dissonance. But I loved my clueless teenagers who try to make their way in the universe. I love that they’re Druids (except for the one Catholic guy who has some serious disparity with his majority-religion friends). I love my spaceships and space adventures that don’t have anything to do with fighting the alien hordes. So I wrote the first book in the Hive Queen Saga anyway. And it worked! Readers on Kickstarter read my sample chapters and backed my project. In less than a year from the publish date, Queen & Commander won an Independent Book Publishers’ Award (IPPY) for science fiction/fantasy/horror ebooks. Now I’m releasing the second book in the series, Hive & Heist. It’s still gloriously unmarketable with its teenage ensemble cast working on a caper, instead of on romance. Worse, I’ve added an adult POV to this mix, a traveling law enforcement officer on the trail of a serial thief and murderer. Oh, and yeah, they’re still Druids... one of the characters even blesses a room on a space station. Hive & Heist is a classic caper story mixed with a police procedural. Queen Rhiannon and her Hive (our heroes) have found safety on John Wayne Station, but with no way to pay their docking fees or medical bills, their debts are racking up quickly. When they revisit their ship to pick up personal belongings, they realize their ship’s engine has been stolen! If they ever hope to leave this foreign place, they must steal back what’s theirs. But far from home and among strangers, who can they trust? Hive & Heist is for all the readers who love for space-based adventures that are a little outside the mainstream. Janine A. Southard writes speculative fiction and videogame dialogue from her home in Seattle, WA. She sings with a Celtic band and is working on the next book in her award-winning Hive Queen series. She’s also been known to read aloud to her cat. Hi, I’m Jennifer Lyn Parsons, editor in chief of Luna Station Quarterly. Thanks to Catherine for letting me natter on about my beloved magazine. Luna Station Quarterly is a speculative fiction online and ebook magazine devoted to publishing and promoting emerging women writers. (Say that in one breath, whew!) LSQ just started its fifth year of publication with the stellar Issue 017. I am also pleased to be starting this year off with a shiny new website. The spit polishing still needs to be completed before it goes live, but I'm really thrilled with how it came out. Rebuilding the site from the ground up was quite a chore! It will be worth it, though, and should be live for everyone to see soon. I’ll be sure to make announcements all over the place (mostly because I’ll be bouncing off the walls with joy). Having a high-quality, usable website is important to me, partly because I build them for a living, but also because the reader’s experience is important to me. Presentation goes a long way in making me want to read something on my own time, and I aim to give the readers that same courtesy. But wait, I should backtrack a bit and talk about LSQ's origins, shouldn't I? It started about 5 years ago now, during a time when I was unemployed. I found a dearth of truly female-friendly short story venues out there and decided to step up and fill the gap. I focused on speculative fiction because it’s what I read, what I know best. So, combining those experiences with my web design/development skills, I suddenly found myself soliciting stories. One of the most satisfying things about LSQ has been the consistent and universal support I've received. I was also delighted when we quickly gained global reach and, to this day, consistently receive submissions from as far away as Australia and as near as the town next door. It makes me really love the internet, trolls and all, because we can come together and support each other across any boundary. We can all cast such a wide net. The content has grown, too. I’m thrilled to say LSQ is a lot more diverse than it was when I started out. It’s always had interesting stories, but the breadth of style, subject matter, and the types of characters populating them now is truly diverse. It’s awesome to see these stories coming in and is very encouraging to me as a glimpse of what the future face of speculative fiction may look like. After a few years of publishing LSQ, I decided to open up a small press to act as a parent company and home for some future projects I’ve got up my sleeve. Luna Station Press was born in 2012, continuing the Luna Station tradition of supporting women authors, but now with the ability to move beyond short stories and into poetry, non-fiction, and, of course, longer works. It’s kind of an experiment and I get to be an explorer, navigating these new uncharted waters of the non-traditional publishing model. I’m grateful to the authors who have come along for the ride, even through the bumps and turbulence. Right now the Press is on hiatus for submissions, but I’d love to see it have another growth spurt in the next year or so. I’ve always got great plans for expanding the Press and Quarterly, now I just need a windfall so I can quit my job and focus full-time on making them grow. Heh. The press is located at http://lunastationpress.com if you’re interested in learning more about the books I publish as well. Guest blog - Author Heather Rose Jones on "Daughter of Mystery"
My goal for Daughter of Mystery was to write a ripping good tale of adventure, love, and intrigue. Set in the fictitious country of Alpennia in the early 19th century, Margerit Sovitre is resigned to abandoning her philosophical studies for the approved goal of making a good marriage. When her godfather unexpectedly leaves her a fortune--including a mysterious bodyguard named Barbara--the world opens up along paths she never expected. But those paths, as well as her developing talent for thaumaturgy thrust her into the center of Alpennian politics and soon she and Barbara must flee an accusation of treason. Beyond the straightforward mind-candy of the adventure (though I like to hope it’s in the “artisanal dark chocolate” category of mind-candy) one underlying theme began to pervade not only Daughter of Mystery but the initial sketches for its sequels: the networks and communities that women build in the face of a society that excludes them from the formal structures of power and agency. Men’s actions may precipitate both Margerit’s hazards and opportunities, but it’s among women that she finds the allies to achieve her goals. The developing romance with Barbara is only the most obvious source of strength. A spinster aunt lends the orphaned Margerit the cover of her respectability, seeing in Margerit the opportunity to finally seize her own small measure of independence. In the capitol of Rotenek, Margerit is welcomed by a loose community of female scholars, from fashionable upper-class dilettantes to hard-headed working-class women hoping for a better life. Her inheritance gives Margerit entrée to a new social world in Rotenek, but it is the female allies she finds there who teach her how to use it for her own purposes. When disaster strikes, the nuns of Saint Orisul’s offer sanctuary both for body and mind, and in the final crisis Barbara’s ties to an ex-lover bring crucial assistance. In the sequel currently in progress (The Mystic Marriage), we see this web of women woven ever more strongly: bound as colleagues, patrons, friends, lovers, and kindred both by blood and choice. Or rather, more of this web is revealed to the reader, for Margerit and Barbara and their friends are only dipping into a vast river that has always flowed through their lives. Women’s ties and friendships often go overlooked, both in history and in literature. But because the very premise of my stories was to focus on women’s lives and their relationships to each other, it was easy and natural to bring these elements to the fore. Not that men have no place in the stories--far from it. They feature strongly as allies and adversaries. But the nature of early 19th century European society sets barriers between the lives of men and women that make the quality of the interactions distinct. I didn’t consciously choose the setting of my story for this purpose, though my own historic interests made it a natural outgrowth. It’s hard to know who we are unless we know who we have been. So many aspects of the lives of women--and particularly of women who love women--have been dismissed or erased from the histories we are fed. Yet the traces and clues are there to follow and to build on. Although I write fiction, it is not necessary to invent whole-cloth to participate in the creation of a usable history of women’s lives and lesbian lives. Fortunately, the roads are better paved and more clearly marked these days than they were when I first started writing in the late ‘70s. My own preference is to ground my historic fiction in fact, not in wishful thinking. (Well, ok, except for the bits with magic.) And in this I am grateful to my own “web of women”: Judith Bennett, Lillian Faderman, Emma Donoghue, Barbara Hanawalt, Sahar Amer, Bernadette J. Brooten, Lotte C. van de Pol, Harriette Andreadis, Judith Brown, Valerie R. Hotchkiss, Carol J. Clover, Helena Whitbread, Edith Benkov, Jacqueline Murray, and so many others (whom I don’t mean to slight by this very partial listing, nor do I mean to slight the male scholars whose work has been useful). One of the difficulties of writing the lives of lesbians--whether real or fictional--in history is to situate them in the context of a “community of the mind” of women-identified women. Without that context, it is hard to avoid an endless series of coming-out stories: “What is this thing I’m feeling? I must be the Only One!” That may have been the experience for many women, but when presented as the norm or as the only voice it becomes a dreary disempowering monotony. In writing the Alpennian novels, it was important to me to choose to write from that subset of stories where my characters operate within a history and a community, not only as women but specifically as women who love other women. Historic fiction has a great power to grant the reader a share in ownership of the past. Daughter of Mystery may be meant to entertain, but I hope it also helps claim that ownership. Guest Blog: Author Octavia Cade on "Trading Rosemary"
The Masque Books imprint of Prime Books is doing all kinds of interesting titles these days and I'm hoping to have the imprint editor in as my guest later on this month or next to talk about all the cool things they're doing now and hoping to do next. This month, my guest is a new author talking about her first book, Trading Rosemary. Octavia Cade has had short stories published in Strange Horizons, Abyss and Apex and other venues and she tweets at @OJCade. Writers are often told to write what we know. This can be difficult when what you want to write is science fiction and fantasy – no-one does know aliens, or vampires, or what it’s like to create a biosphere, to meet mythology at the coalface and know it for what it is. Those of us who write speculative fiction go ahead and do it anyway, on the grounds that imagination is there to be used and not stuffed into a teapot like the dormouse. But imagination without knowledge is a very flat thing – there’s got to be something in it that the writer, that the reader, can recognise and hang on to. If not the alien, then the experience of being alien, of being outcast, of creating something out of yourself even if it’s only nightmares. That’s where Trading Rosemary came in. I wanted to write something I knew, and see how far I could take it. I wanted to see what the world would be like if what I knew were all there was, and mutable. So there’s Rosemary, whose memories are mostly mine, and who lives in a world where memory can be transferred into coins and used as currency. And like any other coin – once you give it away, it’s not yours anymore. It’s not mine either. This is something tangible for most of us, I think, something identifiable. We all know what it’s like to forget things, and how impossible some memories are to forget. How easy it is to forget the things we’d like to remember, and how each of these things change us, inform the person we are today, rather than the person who had our face but who lived five years ago. That person, that collection of memories, is different and they are gone. Push that as far as it goes, and what kind of world do you get? What are its priorities? What are the really expensive memories, and what’s the loose change you pass over for a piece of fruit, for a bread roll? And what happens when you trade away part of yourself and regret it – what compromises are you willing to make? That’s the position in which Rosemary finds herself. She’s got a library of memory, a good one, as much museum as library, a place of preservation, a public good. To improve it, she trades away the sole remaining memory of her grandmother’s final composition in exchange for a rarer coin, a better coin. And it seems like a good deal. But Rosemary’s got a daughter, Ruth, who’s a bit of a brat if ever there was one and Ruth wants it back. Well, these are things we do for children and for heritage. But the person she’s sold it to doesn’t want to give it back. He wants something else – a collection of memories, taken from Rosemary herself. The foundations of her character, the defining points of her life. If Rosemary were to give these away, she’d be changed and changed irrevocably. In a world where memory is currency such change has value, but there’s change and then there’s gutting, and how much can one woman reasonably be expected to accept, and what happens when, if, she draws a line and will not cross? Trading Rosemary is a fractured little novella. Rosemary’s memories are contrasted with fragments of world-building, with what such a social and economic environment does to artists and environmentalists, to explorers and to parents. At its base, it’s a question of identity, and what we can do to lose it – and to keep it. And these are questions that we know. Questions that everybody knows. I’d like to thank Catherine for letting me ramble on here. Thank-you very much! Trading Rosemary is out now from Masque Books. I've been reading and enjoying Laura's first book, Pantomime, and asked her to drop by and talk a bit about it and its sequel Shadowplay (due out in the U.S. 1/7/14). This is a really interesting series, and are amongst the few sfnal books I can think of featuring an intersex protagonist. Buy links are just below Laura's post - highly recommended! I write the Micah Grey series, which is a young adult gaslight fantasy set in a pseudo-Victorian world of the Archipelago. My main character, Micah Grey, was born both male and female, running away from life as a noble woman’s daughter to join R.H. Ragona’s Circus of Magic. That’s the very short summary of the first book of the series, Pantomime, which came out in February, 2013. The sequel, Shadowplay, comes out January 2 (UK) and 7 (US), 2014, and moves from the circus to the magician’s stage, where two illusionists duel, with Micah and his friends caught in the middle. The world of Ellada, the country within the Archipelago where the stories take place, is a formerly great empire, now crumbling. They have rigid ideas of what constitutes proper society in the higher echelons, while poverty and corruption are rife. Micah Grey is, in many ways, caught between the various levels of the world as he navigates his way from childhood to adulthood. It’s no coincidence that his last name is Grey. Micah begins as Gene, forced to try and fit the mould of a perfect noble family’s daughter, and the role chafes. After Gene leaves and transforms to Micah Grey, he finds himself at the bottom of society, on the streets, living hand to mouth. He lives afterward on the outside of society, such as in the microcosm of the circus and then the magician’s theatre, looking in and first observing the difficulties Ellada faces. And then, without quite knowing how, he finds himself drawn deep into Ellada’s troubles. So, that’s my series in a nutshell. 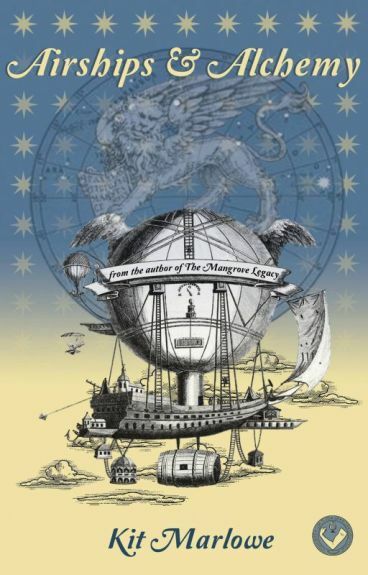 It has circuses, magic, mysterious blue domes, long-vanished civilisations, clockwork body parts, secrets, and romance. I hope you take a peek into the world of Micah Grey. Pantomime was released February 2013 through Strange Chemistry, the YA imprint of Angry Robot Books. The sequel, Shadowplay, will follow in January 2014. I've been reading and enjoying Jill Braden's work for many years under her various pseudonyms (she wrote a wonderful story for my anthology Haunted Hearths and Sapphic Shades: Lesbian Ghost Stories too). When she asked me to blurb her latest novel, The Devil Incarnate, I was immediately intrigued. She deals with the themes of imperialism and resistance in a rich brew of magic and sexuality and I look forward to reading more of these books. "The Devil of Ponong series"
Thank you, Catherine, for letting me chat about my SFF political thriller series, Devil of Ponong. In the first book in the series, The Devil’s Concubine, the titular character QuiTai* is blackmailed into helping her enemy Kyam find a secret bioweapon plantation. (That sounds terribly high tech. It’s a low tech world on the verge of massive technological and political change.) Devil Incarnate is more political thriller than action adventure. QuiTai’s people are pushed to the brink of revolt. She has to stop them before blood runs in the street, but first she has to figure out who is behind it. While I’m a big supporter of diversity in SFF, I didn’t set out to write a story set on a tropical island with non-white characters. All I planned to do was write the kind of book I like to read. Then I had a vision. No, not a vision. That sounds too woo-woo artsy writer-ish. How about I call it a quick little mental movie instead? What I saw was the scene where QuiTai and Kyam meet, and even though the Devil of Ponong series is set on a different planet, the people I saw in that vision were strikingly similar to a Pacific Islander (QuiTai) and a southeast Asian (Kyam). My first reaction to that scene was “Who was that woman?” because QuiTai was so vibrant, compelling and mysterious that I knew I had to find out more about her. My second thought was, “Huh. I guess she’s similar to a Pacific Islander. ” The more I reflected on what I’d seen of her, the more convinced I was that keeping her ethnicity intact brought a wealth of history that would enrich the entire story. Keeping her true to the vision gave me a tropical island setting that was a character in its own right, and economic, racial, and political conflict that intertwined like a parasitic vine slowly strangling its host tree. That’s like asking for a slice of bread but getting a banquet instead. How could I not go with a gift like that? I’m white, so when I began to write QuiTai, I kept in mind Orientalism-- the fetishizing of a stereotype of Asian women-- and the Dragon Lady stereotype. It turned out it wasn’t that hard to steer clear of those depictions. QuiTai is a person, not a type. But that’s also true of her enemies, the Thampurians, who colonized her island. Once a character gets to act independently of the mold they’re poured into, they take on a unique personality. That’s what I enjoy the most about writing in this world. It’s interesting to see how racism manifests itself in individual characters, how it manifests collectively, and how people negotiate the difference between those. It’s interesting to see how similar QuiTai is to her enemies and how different she is from her people, although she’d never admit to such a thing. And on a larger scale, I’m fascinated by dynamics of the lush, fertile, almost feminine land of Ponong dealing with the invasion of hyper-masculine sea dragons who forcibly subjugate it. In real life, no one thinks of themselves as a villain. That’s how my characters act. From the viewpoint of the Thampurians, QuiTai is the villain. Ruthless and brilliant, she runs the Devil’s criminal network of smugglers, blackmailers, drug peddlers, and informers. Her people split on how they feel about her. Some, who witnessed or took part in mob justice (Oh yeah, forgot to mention that my indigenous people aren’t placid virgins waiting in a tower. They sometimes do terrible things. They can also be wonderful. In other words, they’re people. ) hate QuiTai because she encouraged them to act in a way that later shamed them. They generally don’t accept responsibility for their actions that day because it was so horrible. Instead, they blame her. This is how people are. It’s not how we want them to be, but it’s truth and showing that is more important to me than enforcing a simple vision of noble savages (an annoying racist meme in its own right) versus evil invaders. Those people who weren’t involved in the mob justice seem to feel QuiTai was a hero that day but are ambivalent or negative about her ties to the Devil. The rest of the population has no idea who she is and have no opinion one way or another. This isn’t hive mind. Everyone in this culture is an individual. As far as QuiTai is concerned, the Thampurians who colonized her island, stole the land, and enforce injustice are the bad guys. She makes a slight exception for Kyam, but she’s more than willing to blame him personally for everything his government and people do, individually and collectively. The animosity is so intense that even when faced with a common enemy, she won’t willingly work with him. While the common belief is that science fiction starts with the question, “What if?” my favorite stories seem to ask, “What does it mean to be human?” Some people think science fiction only means space ships. Anthropology is a science too, and just as fascinating. I’m not only exploring racism and feminism, but also gender identity and sexuality as I search for the answer to what it means to be human. But feel free to call my stories fantasies. I’m more interested in dialog than labels. Thank you, Catherine, for the chance to talk about the ideas behind my series. The Devil’s Concubine and The Devil Incarnate are available as ebooks and in print at your favorite online bookseller. on author Joel Arnold's blog. Which was quite fun. Check out the other posts too - Joel interviews a really interesting range of publishers and authors. Guest Blog: Author Jacqueline Koyanagi on "Ascension"
This month's guest blog is by new novelist Jacqueline Koyanagi, whose novel Ascension, was recently released by Masque Books. This is definitely going on my TBR list: a starship engineer protag who's queer, disabled, and a woman of color? Count me in! Ascension is on sale in ebook format now but you can also preorder the print version, which is due out in December, here and here. And you can read more about Jacqueline here and see her lovely jewelry at HelixChainmaille. I’m delighted to talk about my science-fantasy queer romance, Ascension, and its characters, the crew of the Tangled Axon. At its heart, it’s a story about found family and the lengths people will go to self-actualize, so I thought I’d focus on the characters for this post. The main character, Alana, is a sky surgeon (starship engineer) who makes plenty of mistakes on her way to finding her place in the world. Because the novel features her emotional journey through chronic illness, poverty, the trauma of loss, and falling in love, I chose to write it in first person and focus entirely on what’s subjectively important to Alana. That turns out to be her undeniable passion for starships, the Tangled Axon in particular—a passion that borders on sensuality. In fact, she’s so taken with the Tangled Axon that her desire to be on the ship gives her a case of tunnel vision. Still, her innate talent for connecting to the suffering of ailing starships lends her an ability to diagnose and repair them that’s half-mystical in nature. We learn that this talent is connected to the abilities of her “spirit guide” sister, Nova, who makes a living lending her psycho-spiritual talents to clients. Anything from serving as muse at a writer’s retreat to divining paths to large profit margins at Fortune 500s. She finds Alana’s obsession with starships tiresome and pointless in a world where the need for engineers is becoming obsolete. I’ll let you read the book to find out why! Alana’s love interest, Captain Tev Helix, has her own traumatic history to contend with in addition to supporting herself and her crew from transport job to transport job. Her initial impression of Alana is that she’s immature and unrealistic, but Alana’s determination and passion turn out to be the very qualities that pluck at Tev’s heart. Tev’s main concern, however, is saving her beloved pilot, Marre, from disappearing—literally. Marre’s body flickers in and out of existence, layer by layer, piece by piece, and the crew of the Axon is trying to find a way to save her. Even her mind straddles the line between coherent and seemingly psychotic as she tries to hold onto herself. Alana’s connection to her chronic illness, Tev, the Tangled Axon, Marre, and her sister make up the connective tissue of her journey in Ascension. My hope is that the book reaches readers who want a story about pursuing eudaimonia through a cultivated sense of kinship with people who have struggled to feel safe in broader culture. The book’s digital edition is currently available through Amazon and Barnes & Noble, but the trade paperback releases in December of this year. Thank you to Catherine for giving me the opportunity to talk about the book! Guest post: Author Susan Jane Bigelow on "The Daughter Star"
I'm pretty excited to have Susan Jane Bigelow as my guest blogger this month. Susan's already the author of the Extrahuman series - Broken, Fly Into Fire and The Spark, all from Candlemark & Gleam Press. The Daughter Star is book 1 of her new science fiction series and it looks like another excellent read. Check out what Susan has to say about it below and preorder the print version on Kickstarter. Hi everyone! I’m Susan Jane Bigelow, and I’m here today to talk about my new book, The Daughter Star. It’s the story of trade ship pilot Marta Grayline as she tries to care for her sister Beth, get answers to her questions, figure out her relationship with her long-distance girlfriend, and find the freedom she so desperately craves against a background of interplanetary war and alien intrigue. This book is the first of three focusing on the three Grayline sisters, Marta, Violet and Beth, and their roles in changing and shaping their world. It’s also about truth, tenacity, faith, growing up, family, love, and a whole host of other things. It’s been an amazing and challenging series to write so far, and I still have the third book to write! This story started out as a “pace book” to The Spark, which is the third book in the Extrahumans series. See, The Spark was a very stressful and emotionally draining book to write for me, and every once in a while I felt like I needed a break. So I started working on a fun space adventure story to distract myself when I felt burned out on The Spark. I created the character of Marta, who so enthralled me that I soon found myself lost in her world, and the character sketching I was doing soon began to stretch into a full-fledged novel. I worked on both books concurrently, and actually finished the first draft of Daughter Star before I finished The Spark. However, it turned out that The Daughter Star needed a ton of work. This was partly because of the somewhat odd and offhand way in which I’d written it. I wrote at least five different endings before I found one that really worked for me, and led into the next book in a way that made sense. I eventually tightened the story up, made it more serious in places, and gave both Marta and her world a lot more depth. I learned a lot while writing this book. I’d probably never do the “pace book” thing again, though it was fun and gave me a real sense of accomplishment. I also learned that there’s nothing like a massive load of revisions and a looming deadline to focus my creativity. But what I learned that I value the most is that I can still write the kinds of books that I really want to read and share with everyone else. The book releases on 5/28, and will be available on Amazon, BN.com, the Candlemark & Gleam website, and retailers both electronic and physical worldwide. I hope folks check it out! Thanks to the amazing Catherine Lundoff for having me on!